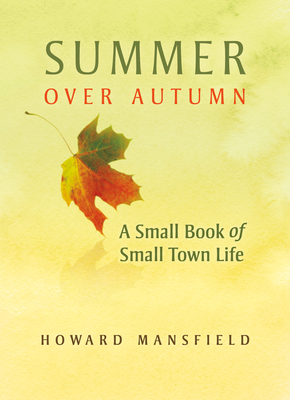 Howard Mansfield's new book, Summer Over Autumn: A Small Book of Small-Town Life is named for what Mansfield calls the moment in late summer when the season is still going strong but you get that first glimpse at autumn. There's a moment every summer when I look up at a nearby mountain and see a weakening of the green, and here and there like a splattering of paint, the first yellow leaves, writes Mansfield. Autumn is beginning to slip out from undercover. I think of this moment as its own distinct time, as Summer Over Autumn. This is the moment that precedes the fall snap, the great colors, and the final bare season in November. Mansfield's new book is about such moments. Summer Over Autumn is a small book of small-town life. He has written twenty-one short essays over the last thirty years, stories about neighbors, animals, tractors, trees, yard sales, funerals, money, and fidelity to time itself. It's a book about the crooked path that is New Hampshire, about the parts that are postcard pretty, and the rougher parts that have a kind of hidden grace you have to live with to really see. He doesn't waste time with the quaint postcard view of a New England town, but shows readers where the real merit of small-town life lies. It can be found in the war waged against invasive, wild rosebushes, the hopeful placing of bets in the elm tree lottery, the artful dance of fundraising, and in bribing the band to play longer at the mechanic's anniversary party. He brings us the hidden stories in one chair, a conversation in passing, or a Fourth of July fireworks display. Like Hancock's crooked Main Street, the town and these stories are not just there for reminiscing; they are a breathing lesson. Howard Mansfield is an everyday tourist and detective of the nearby. His ability to fully immerse himself in the here rather than rushing on towards there, has helped him create the wonderful essays in this small book full of big ideas. HOWARD MANSFIELD sifts through the commonplace and the forgotten to discover stories that tell us about ourselves and our place in the world. He writes about history, architecture, and preservation. He is the author of nine books, including In the Memory House, The Bones of the Earth, The Same Ax, Twice, and Dwelling in Possibility: Searching for the Soul of Shelter which The Boston Globe called "a wholly original meditation ... that's part observation of the contemporary built environment, part cultural history, part philosophical account, and at times something like a Whitmanian poetic survey."